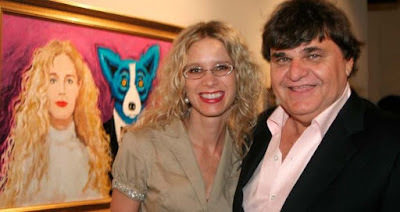 The Life & Legacy Tour began because I felt compelled to help others experience George Rodrigue in a more personal way. After eight months, the tour is in demand more than ever, with no end in sight! And perhaps that's exactly as it should be. Want to know what it's like? Here's a video from Dr. Jules Boquet of Messiah Montessori School, a Louisiana A+ School in Houma, Louisiana. Turn up the volume, stick with it (about 30 minutes), and grab a tissue ....just in case. The kids ask poignant and meaningful questions that take us together on an intimate journey into the life and art of George Rodrigue. Topics include Jolie Blonde, Blue Dog, Rodrigue Jewelry, and the story behind one of his greatest paintings, Loup-garou; plus George's relationship to Louisiana, California, New Mexico, and the road; his painting style, work habits, outlook on life, thoughts on success, and even his illness. Friday, June 15th, 5:00 - 7:00 p.m. Opening reception for Rodrigue's Blue Dog: Discovering Late Works on Canvas and Metal, an exhibition at the Ohr-O'Keefe Museum of Art in Biloxi, Mississippi, featuring 25 large scale late works by George Rodrigue, many on view for the first time. Exhibition continues through Aug. 18, 2018. Learn more. Saturday, June 16th, 1:00 p.m. A personal tour of the exhibition Rodrigue's Blue Dog: Discovering Late Works on Canvas and Metal at the Ohr-O'Keefe Museum of Art. A book signing follows. Learn more. Thursday, June 21st, 6:00 - 8:00 p.m. Celebrate the Summer Solstice! Please join me for a personal tour of the exhibition Rodrigue's Swirling Vision: The Sun, Cosmos, and Hurricanes, on view at Rodrigue Studio New Orleans through October 27, 2018. Learn more.